Sierra Repertory Theatre or SRT is a professional non-profit theater producing a year-round season of classic and contemporary plays at two locations — the East Sonora Theatre and the historic Fallon House Theatre in Columbia. The talented resident company and visiting guest artists include members of Actors’ Equity Association and the Union of Professional Actors and Stage Managers. 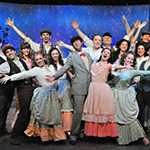 High quality performances, production values and management have established Sierra Rep as a model for regional theater. Sierra Rep’s 200-seat theater in East Sonora is intimate, attractive and comfortable; with excellent sight lines and acoustics, and no seat more than 10 rows from the stage. The Fallon House is a restored Gold Rush-era theater and inn located in Columbia State Historic Park. It seats 260. Both theaters are centrally heated and cooled and wheelchair accessible. The East Sonora Theater has an assistive listening system for hearing-impaired patrons.